I just spent most of the afternoon trying to get WebSockets working with Visual Studio 2012 and an MVC project. Most of the examples seem outdated (from old RC builds) or too low level, and the few updated ones weren't complete. So, here's my little guide on how to get started with a simple echo/chat program. It just takes 2 classes and a test page. 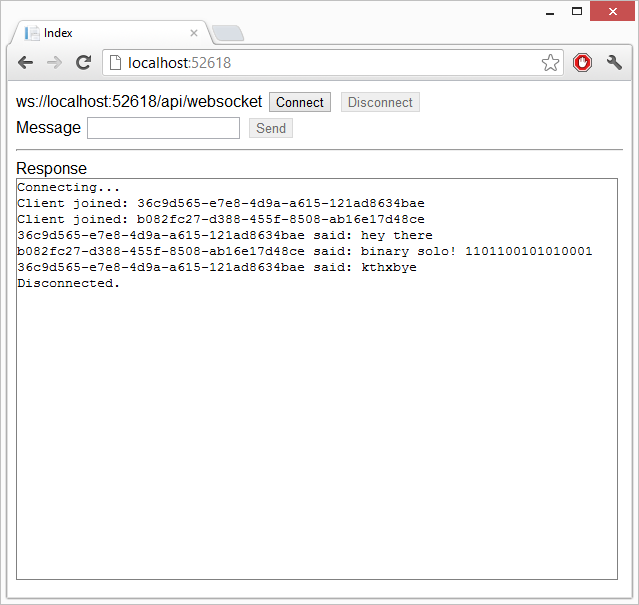 NOTE: WebSockets on IIS only works on Windows 8. Windows 7 does not have the necessary websocket DLL that is needed by IIS. :( That wrinkle aside, WebSockets will work with IIS 8 Regular or Express editions. This demo used IIS Express. Note I'm using Guid as a connection id, and the messages end up looking pretty ugly: 0195093f-70a5-4bfe-b707-8ac96ba94c31 said: test. But you can change that for your own needs. The next step is to setup an ApiController. 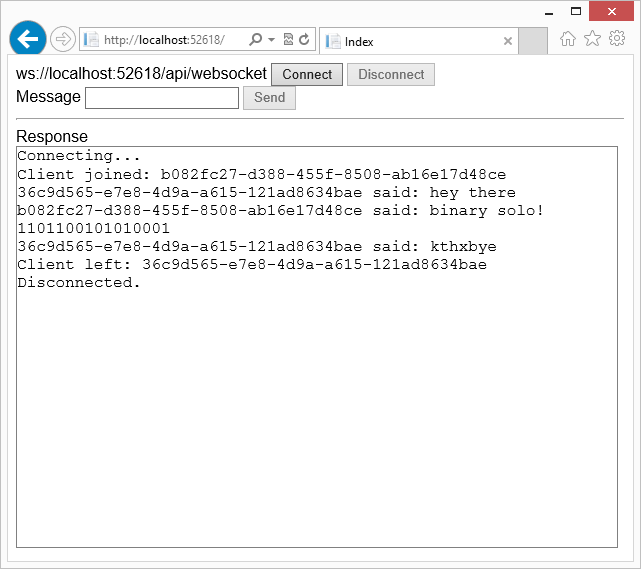 This is necessary to upgrade the HTTP request to a WebSocket request. As noted in another example I found, the first using statement is VERY IMPORTANT. It adds the AcceptWebSocketRequest overload that is needed for this code. The other overloads are lower level than I wanted. NOTE: Change the uri value to match the port your project uses. Otherwise it should work as is. And here was my test run in Chrome 21 and IE 10.